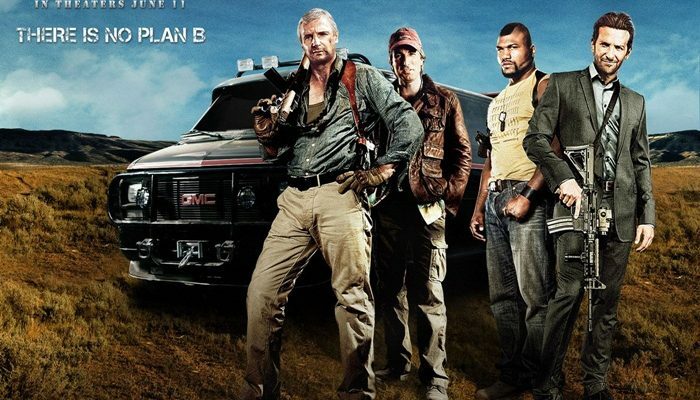 Based on the hit 80's TV show of the same name, The A-Team finds a group of top-notch mercenaries working to clear their name from a wrongful charge and bring down the corrupt spies and military officials who put them in prison. This is a film that had true potential: the casting is spot-on and the camaraderie between the actors in infectious. The first twenty minutes or so suggest that this film will be filled with laughs and inspired mayhem. Sadly, a boring story, second-rate special effects, ridiculous action sequences, and an uneven tone bog down the proceedings. Though there is some witty dialogue and the actors are clearly enjoying themselves, these positives only caused me to sigh at how much fun this film could have been. The A-Team is rated PG-13. Though it is implied that one character is a ladies' man, there is no sexuality and only a handful of moderate profanities. There is a good deal of action violence, however. One character smokes cigars throughout. Though peace is the ideal, lethal force can be necessary when defending freedom and innocent lives. Though traitors betray others out of greed, the greatest love is to be willing to die for your friends. One of my favorite film adaptations of a TV series is 1990's Teenage Mutant Ninja Turtles, with puppeteering and costumes by the late, great Jim Henson!